OOOOO that Pinot Meow* catnip wine feast for National Wine Day yesterday! I took the bottle away from my sis-fur Paprika and...I may have overdone it...you think? 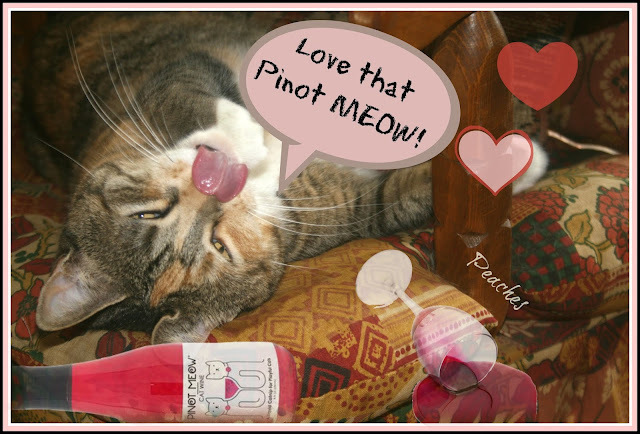 *Pinot Meow is a special catnip wine we got from Meowbox a while back. My human used pic monkey & photoshop for this cartoon but I will not give her any of my stash! We're joining Athena & Marie's Caturday hop today! Do you have a hangover, Peaches? But it was worth it. Gosh that sounds delish! Why didn't my Mom get me some of that????? Whoa! That must be good stuff!